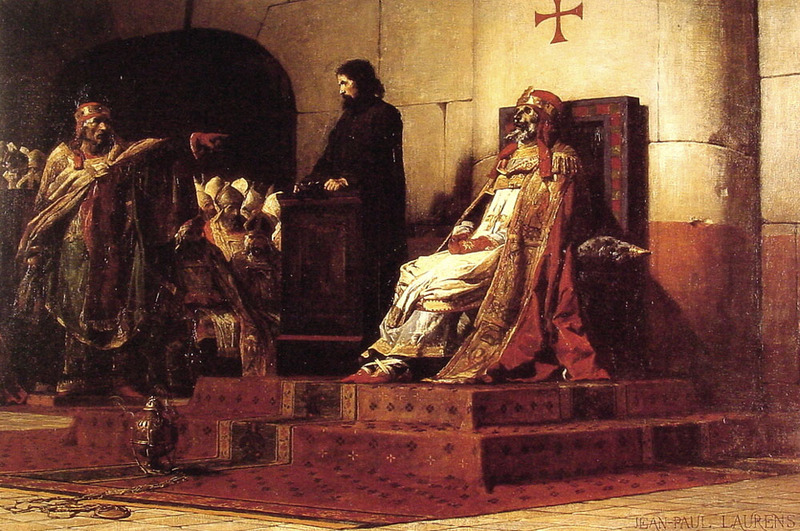 In August 897 or so, the deposed Pope Stephen VII (or VI*) was executed (or just murdered) in prison by strangulation. Details, you see, are thin on the ground here in the so-called Dark Ages. Rome has come down a bit in the world. While the popes of the 10th century would really set that prostituted standard with the period known as the “pornocracy”, Stephen VI(I) makes everybody’s bad popes lists with one of the papacy’s all-time embarrassing events: the Cadaver Synod. The pontiff at this point is no global media celebrity but an ensemble character captive to the the disreputable politics of a shrunken, malarial borough. Stephen’s predecessor Formosus had been one of the city’s “Carolingian” faction backing the withering remains of Charlemagne’s once-great line. At loggerheads with the Italian Spoleto family claiming the Holy Roman Emperor title for the anti-Carolingians, Formosus had invited an illegitimate Frankish scion to roll down the Italian peninsula and take it from them — which is exactly what happened. Two months after Formosus crowned this Carolingian, Arnulf by name, as “Augustus” in Rome, Formosus died while Arnulf was on his way back to Bavaria … putting the Spoletos back in charge. After a brief interregnum papacy, the Spoleto-backed anti-Carolingian prelate Stephen ascended St. Peter‘s throne. The factional conflict was approaching civil war. Stephen’s Cadaver Synod (or in the equally evocative Latin, Synod horrenda) was a singular show of power against the Carolingians. Eight months before, exhumed thus for the nonce. Upright on Peter’s chair as if alive. How nowise lacked there precedent for this. After the possibly-nuts Stephen had his fill of ranting at the mortal remains, he declared his foe “convicted” and condemned the body to the dissevering of its three right-hand blessing-fingers — symbolic of the damnatio memoriae the synod would pass upon the ex-pope, revoking the decrees and undoing the ordinations that hand had wrought in life. Formosus in his various parts was tossed into the Tiber. While this macabre spectacle lives forever in the papal annals, Stephen didn’t live out the year: his enemies overthrew him that summer and had him summarily put to death, declaring the Synod horrenda‘s judgment reversed in the process. In the event, the matter would be settled the old-fashioned Roman way: in the streets. Despite the loss of their leader, [Stephen’s] party remained active and elected a certain Cardinal Sergius as pope, simultaneously with the election of a candidate by the opposite faction. But, in a sudden burst of violence, Sergius and most of his followers were chased out of the city … Over the next twelve months, four more popes scrambled onto the bloodstained throne, maintained themselves precariously for a few weeks — or even days — before being hurled themselves into their graves. * Between VI and VII, it depends on whether you count a short-lived 8th century Stephen in the list of Stephens; the popes at this time weren’t using regnal numbering themselves. Since the Catholic Encyclopedia’s roster of popes goes with VII, we will as well. ** Ironically, “Formosus” is Latin for “handsome”. It’s too bad he wasn’t “Pope Mephitis“.